Imagine a grim, appalling, but unfortunately all-too-common scenario. A primary school is under attack from a deranged gunman. Shots have been fired, and the gunman stalks the school corridors, looking for children to kill. In one of the classrooms, a nine-year-old child is cowering under his desk with his teacher, both hearing the approaching footsteps of the gunman. As the gunman opens the door to their classroom, we freeze time, and imagine two possible alternative scenarios. In the first, both teacher and pupil are unarmed and defenceless. In the second, the teacher has a firearm, which he has in a holster. Given these specific circumstances, I’m sure most of us might consider it would be better – at that specific moment – for the teacher to be armed with a gun, than to be unarmed and defenceless. With a gun, he might, at least, be able to surprise the gunman, leaping up from his hiding place and firing several rounds at him, incapacitating him. That would certainly be better than the alternative of being effectively powerless as the gunman enters the classroom. So, given these specific circumstances, we could reasonably think that is a good idea for a primary school teacher to be armed with a gun. But would any of us then draw the conclusion that it is a good idea to arm primary school teachers in general? Just because our particular teacher might benefit from having a gun in the specific circumstances of a gunman approaching him down a school corridor, do we then think it makes sense to for all primary school teachers to be equipped with an easy-to-access handgun, throughout the school day? That – to me at least – actually sounds like a pretty dangerous idea, even if I might have agreed that it would definitely be better for the teacher to have a gun, than to be unarmed, under the specific conditions of our thought experiment. I certainly wouldn’t be easily persuaded that the ubiquitous arming of primary school teachers is consequently a good idea, and I would also be resistant to accusations of being inconsistent. This is because there are lots of reasons why arming primary school teachers is a bad idea. Those reasons don’t become any less compelling if a primary school teacher might benefit from a handgun in a classroom when the school and its pupils are actually under attack. To make this even clearer, we could go further and imagine the nine-year-old child is alone in the classroom as the gunman approaches. Again, we might agree that the child having easy access to a handgun at that specific moment might be a good idea, while being appalled at the notion of all nine-year-olds arriving at schools equipped with handguns. Anyone who is arguing that arming primary school teachers (or nine-year-old children) is a good idea in general, based on a specific, isolated scenario like the one outlined here is effectively performing something amounting to sleight of hand. It’s a pleasingly simple argument that unfortunately misses out all the reasons why arming nine-year-olds with guns when they go to a school might not be a good idea (negatives), and that also misses out all the other ways we can potentially stop nine-year-olds from being shot (positives). But of course many people in the United States do actually think like this, at least when it comes to arming teachers. Many schools think it’s a good idea for teachers to be armed. For these people, the potential negatives of teachers being armed aren’t being considered, or are outweighed by the persuasive argument that teachers would then be able to protect themselves once an attack is already underway, something they would not be able to do without a gun. Likewise one powerful way of reducing the likelihood of children being at risk of being shot at in the first place – gun control – is completely unthinkable for a large swathe of American society. We wouldn’t employ this kind of logic in Britain, would we? Perhaps the closest analogy might be knife crime. Unpersuasive, right? While we might agree that a teenager being attacked with a knife would – in those specific circumstances – benefit from a stab-proof vest, we wouldn’t think that all teenagers should therefore be walking around in stab-proof vests, or even just those teenagers in areas with particularly high knife-crime. The correct response would be to take positive steps to prevent teenagers from being stabbed in the first place, rather than fitting them all with cumbersome protective equipment – while also taking into account the direct negative consequences of having to wear that protective equipment. The examples don’t even have to involve violence. Just because we accept that a pedestrian directly under a falling brick would be better off with a hard hat, we shouldn’t then be compelled to accept that all pedestrians should therefore walk around wearing hard hats. We’ve missed out all the other potential ways we can stop bricks striking people on the head, and all the potential negatives of compelling people to walk around with hard hats on. And yet. And yet. It is precisely this form of argument that is, unfortunately, extremely common in discussion and debate around cycling safety in Great Britain (and indeed across much of the world). Certainly, if I was cycling along and I found myself confronted with a motor vehicle heading unavoidably towards me, I may think that – under those specific conditions – some polystyrene might lessen my chances of injury. But as with all these examples here, that would be a poor basis for arguing that anyone cycling around should always wear a helmet. Doing so misses out all the positive ways we can stop people being hit on the head by motor vehicles, and all the negative consequences of forcing people to wear helmets when they want to cycle somewhere. Possibly contentious assertion: the cycle helmet debate is unhelpful in exactly the same way as the gun control debate: because people confuse systemic effects with specific cases. Something might be a good idea under specific, exceptional circumstances, but that’s not a sound basis for suggesting it’s therefore a good idea in general. The aforementioned sleight of hand involves removing that distinction. This photograph from a recent academic conference on emergency medicine managed to attract 129 retweets, and was shared many more times, by doctors, nurses, students and paramedics, all agreeing with the expressed sentiment that cyclists should definitely wear helmets, at all times, on the basis of the statistics shown in the chart. Doubtless, in the specific circumstances of people suffering an injury serious enough for them to be admitted to hospital, those injuries could well have been less severe if they had been wearing protective equipment. But is that a sound basis for arguing that all people should wear protective equipment at all times? It most certainly is not. It ignores all the sensible ways we should be preventing injuries from happening in the first place, and ignores all the negative consequences of compelling people to wear protective equipment at all times in an attempt to mitigate serious but rare injuries. or indeed whether compelling people to wear personal protective equipment has any effect on injury rates at a population level. We can speculate about why it is helmet-wearing among people cycling that is repeatedly subject to this superficial level of argument. My hunch is that – among other possible explanations – it originates with a failure to conceive of ways in which we can prevent, or lessen the severity of, head injuries to people cycling around, beyond strapping helmets to them. We simply can’t imagine a world in which people cycling around don’t suffer the risks posed by motor traffic, or a world in which cycling could be a genuinely low-risk activity. Consequently, if we think exposure to motor traffic danger is somehow inevitable, immutable, our responses to cycling injury are inevitably going to be limited to protective equipment. In this sense, our response is analogous to the gun control debate in the United States, where for some people the idea of reducing or even removing access to guns among the general population is effectively unthinkable. Consequently, for these people, guns and the danger posed by them are also inevitable, so much so that arming teachers becomes the only logical response. We shouldn’t be constrained by our failure to imagine alternatives. This entry was posted in Helmets. Bookmark the permalink. Indeed . I amused myself once by drawing a graph of various countries showing % cyclists un-helmeted vs cycling fatality rate. There is a clear negative correlation. Accepted that does not show that just removing a helmet necessarily makes one safer (although one may be give more space) but that there must be much better ways of making cycling safe. It does seem to be an obsession peculiar to the English-speaking world. I saw a newspaper photo last summer of Emmanuel Macron cycling while at a seaside resort (I think it was) in normal clothes and no helmet. I remember at the time thinking that Teresa May couldn’t have done that – there would have been outcry in the English tabloids about what a bad example she was setting. She would have had to wear high-viz and a helmet, which is of course why she will never be pictured riding a bike. French President cooler than British PM? Shock! Many of the British Royals cycle, especially around their country estates, but rarely for photo ops. There’s a photo op of Princes Charles, William and Harry cycling at Sandringham from ages ago and William has been papped and spotted cycling recently (often with protection officers cycling along) but I think Harry’s been seen more on his quad bike lately (without conspicuous protection officers now he’s an adult military officer and further away from the crown). The newspaper behind the second link writes that there are 15,000 heavily injured cyclist in one year. When Germany would have a Dutch-like bicycle infrastructure I wonder how many it would have been. As a Government you don’t provide a safe bicycle infrastructure, but state that cyclists should wear helmets to avoid injuries. How astonishing. Both articles are trying to scare people. “Be aware, if you don;t use a helmet you will get yourself killed in an accident.” The second newspaper writes that a mother and son rode side by side on their bicycles. The son collided with his mother. Because of the helmet the son wore he had no injuries. BUT, the mother didn’t wear a helmet and had severe injuries at head and brain. Providing a safe infrastructure earns itself back. Because there won’t be severe injuries the costs of health care will be less. A investment of 50 million €’s will be earned back as 250 million €’s because the costs for health care etc. will be less. Cycle helmets aren’t designed or tested for motor vehicle collisions anyway. They’re basically irrelevant to the main risk of serious injury while everyday cycling. I’m surprised you don’t mention that. Like the gun lobby pushing the interests of the firearms industry, there is a bicycle helmet industry which profits from the countries with mandatory helmet laws and they spend money to stay in their comfortable profits. That and the Australian/New Zealand requirement that helmets carry a marking to their own standard, so manufacturers have a captive market. But of course, despite being arguably ineffective, helmets are compelling because here is something that I (as a cyclist) can actually have control over. I can go out right now and buy a helmet, and be wearing it within half an hour. 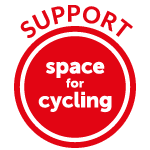 As much as I want safe space for cycling, how can I ever make that happen, even in a timescale that will allow my kids to benefit? I know, I work with local campaign groups and contact politicians, and lead by example, and Manchester is seeing some progress, but it often feels like widdling into the wind. In the UK, it’s too much of a priority to be able to drive and park anywhere without impediment. So we’ve all but given up cities where we don’t have to worry about violent road death and air pollution and so on. Once you’ve made the assumption that riding on fast busy roads is the best that people on bikes will ever get, then helmets seem like the only logical option left. You may be able to have control over the cycling environment but it’s not as easy. For example, when moving home, you could make access to a good cycling network a factor or even a priority. That’s part of the reason I now live where I do: kerb-protected space for all but about 100m of the 5 miles to the town centre 20mph zone and that 100m is a 30mph that only goes to the 20mph. The last picture and the paragraph above it says it all. Prevention is better than cure. “We simply can’t imagine a world in which people cycling around don’t suffer the risks posed by motor traffic, or a world in which cycling could be a genuinely low-risk activity.” Come to The Netherlands to see that such a world ain’t an imagination, but daily reality. Your blogs are always excellent. Well-written, well-researched and well-thought out. There is a ‘but’ coming, of sorts. I would be happy to cycle helmet-free, if I thought the facilities were there. If we had decent cycle paths and a culture of cycling where cyclists were embraced not as a nuisance but as part of the transport network, then yes, I would dispense with the lid. However, here in Ireland, cyclists are barely tolerated on the roads, and more to the point, the infrastructure is not there to make cycling relatively safe. I say that about the roads as here is the real issue with helmets: they will protect my face and head to a degree from falls and other knocks, and that’s why I wear one. It won’t do me much good if I go up against an artic. This I know from my work in the fire service. I’m no corporate shill. I don’t think I am lining someone’s pockets when I buy a helmet (or indeed any bike gear). Someone is going to make them, and sell them, and I generally buy this basic stuff in discount stores where I know the price is acceptable, and the gear passed for the job for which it was designed. Sure, maybe not flashy or aero, or decked out in the right colours with the right decals, but fit for purpose. I have read the arguments for and against helmets, and I would like to think I have a reasonable grasp of statistics (and also how they can be used and abused). I know they won’t save me from catastrophic injury. But for the same reason gloves might save my hands from the worst of gravel rash if I take a spill, a lid might save my noggin from similar lumps and bumps. If cycling in your part of the world is as dangerous as you say, a helmet wouldn’t be enough for me to feel relatively safe, as it leaves plenty human body exposed, so I would probably stop cycling. Fortunately, I live in The Netherlands where cycling is an accepted way to get around, and you don’t have to mind motorists too much, as most of them are cyclists, too. Articles like these always make me wonder why, in some parts of the world, cyclists are seen as the dregs of society. Is there more animosity in general and of not, what did cyclists ever do to deserve their pariah-like status? It won’t stop me from cycling but it does make me aware of the risks, and I take measures to avoid them; key to that is avoiding national roads where the bulk of the fatal accidents happen. I don’t cycle for transport. I cycle for leisure and/or exercise, so I have the luxury of avoiding busy roads. I live 18k from Dublin city centre and I know quite a few folk cycle in to work on what are some of the busiest roads in the country. Fair play to them, but I wouldn’t do it for any money. The helmet debate does tend to split the bike community, which can be a shame. We need to stick together. It really shouldn’t be such a contentious issue. But as for the Irish attitude… maybe a sociologist or psychiatrist could offer you more insights into the psyche of the average Irish person. I’ve tried to fathom it out for years, but I’ve given up 😉 I suspect, for what it’s worth, that cycling is seen as something inherently foreign therefore not to be trusted. Irish readers are free to disabuse me of that pop-psychological notion. One day, if we ever achieve the critical mass of cyclists required to overhaul our behaviour on our roads (and let’s not forget, the vast bulk of us are not single-use folk; we also are drivers and pedestrians), then we can look forward to a Dutch-style model where cycling is the norm. But that won’t happen in my lifetime, alas. “I say that about the roads as here is the real issue with helmets: they will protect my face and head to a degree from falls and other knocks, and that’s why I wear one.” — unless you’re wearing a full-face BMX-style helmet tested to whatever Snell standard it is, that’s overestimating the protection they offer. The required protective area on a common open EuroNorm oversize-skullcap helmet is the top, a certain number of centimetres above the horizontal axis of the head. The front is not protective and often things like visors are attached that relatively easily detach in a collision and stab the wearer in the forehead/face, although it’s only a relatively soft plastic so not as bad as some things. There are other cheaper, lighter, smaller hats which will save you from the majority of scrapes that don’t seem to have the drawbacks of the polystyrene mushrooms. I think if you stand back, view it objectively, it’s not the cyclists who suggest that they get more abuse when dressed as a partial stormtrooper who are deranged. It’s some of the helmet promoters who overegg the protection they offer. If you feel you are at risk of “taking a header” right over the top of your handlebars, then a helmet is a rational response. If you feel that motorists are treating you badly, making yourself look even less human and reasonable seems bizarre and self-defeating. Yep, some good points there MJ. Like I say, I’m not precious about these things, and I’m not overestimating the amount of protection the lid might give me. Certainly the plastic ‘visor’ stuff is chucked from the outset. There other dangers that come from biking, sometimes at serious speeds, other than motorists. But I take your point. Great post. I’m so glad you brought it round to the helmet debate. As an American, the flawed ‘logic’ in response to the mass shootings –wanting to arm teachers– is appalling; unconscionable. And it is definitely the same sort of ‘logic’ applied to helmet use. Plenty more where that came from. 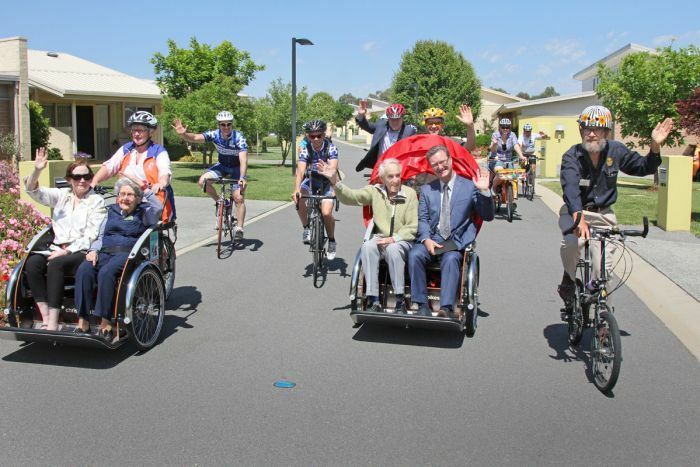 It looks like the pedallers are required to have helmets but not the passengers. Go figure. They have seatbelts for the passengers so the risk of falling out/off is greatly reduced. But the exemption has been in place much longer and specifically applies to paying customers on 3 or 4 wheeled bicycles, which are not required to have seatbelts or helmets. Again you simply need to look to the commercial operators who didn’t think they would get any customers for their bicycle taxis if they had to wear helmets (think of a taxi seat, then think about wearing it on your head). Follow the money. I’d trust me with a firearm because I’ve got twenty years of training. The cursory training teachers would be given – the bullets go here, this is the safety catch, try to hit the bullseye – I really, really want to punch whoever actually came up with that (Trump’s to stupid to think of it himself), Know this is a cycle forum but Aseasyas lead with that topic. In fact what I would like to have seen is the argument being used with regard to SEAT BELTS IN CARS. I and of course John Adams have been pointing out for years that while he seat belt helps AFTER THE CRASH HAS HAPPENED you have to look at what leads up to it. the point I am getting to – which I don’t think is addressed in your article – is that the effect of the wearing of the seat belt (and the same applies to crashworthiness of cars and the features of a highway environment which are tolerant of bad driving) tends to be NEGATIVE IN TERMS OF DRIVER BEHAVIOUR (excuse blocks!). Now, risk compensation – for that is what I am talking about – doesn’t trouble me with helmeted cyclists. (Although it does explain the lack of evidence for cycle helmets in the real world). What troubles me is the way in which crashworthiness for cars etc. accommodates driver danger, in the same way that arming schoolteachers contributes to a literal and metaphorical arms race. What DOES trouble me about cycle helmet advocacy is that – I repeat – compensatory behaviour by a lidded cyclist isn’t a big problem – but the allocation of responsibility on to the cyclist diverts attention away from the problem of motor danger. That it’s a red herring and victim-blaming.